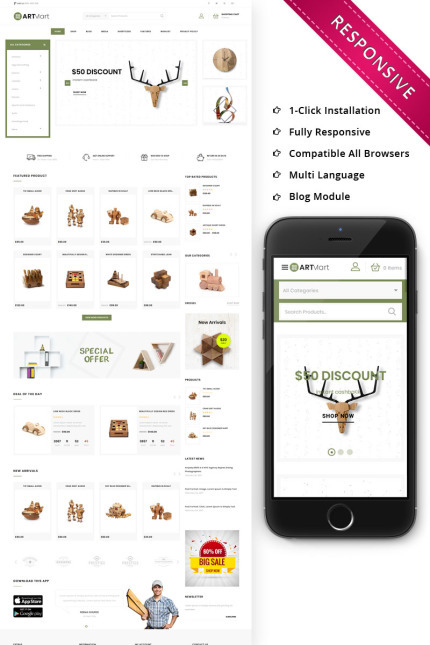 Artmart is an elegant and appealing WooCommerce Responsive theme uniquely designed for creating online stores selling arts, crafts and handmade products. This template packed with advanced features and visually impressive page layouts in order to promote your products across the world in an enriched manner. Also, this theme comes with powerful drag and drop sections to make your shop creation easier. Its Responsive Design looks great on desktops, laptops, tablets and mobiles, iPhone or iPad now.